This painting might be more accurately titled “Ships in Ice off Fort Point,” as the vessels are much closer to that location, even if all we see is a corner of George H. Rogers’s wharf projecting from it. Winters on Cape Ann are seldom so severe that a significant part of Gloucester Harbor will freeze over. Two such events were indicated on the original U.S. Coast Survey chart of Gloucester Harbor, which was completed in 1853 and updated to 1875. The first freeze was in the winter of 1855–56 and was confined to the Inner Harbor east of a line from Duncan’s Point to Rocky Neck. The second took place the following winter, covering the entire harbor out to a line extending from Norman’s Woe to Eastern Point. In Lane’s painting, the line of ice extends from Fort Point to Rocky Neck’s western shoreline, but not as far as Ten Pound Island. The extent of the ice eliminates the possibility that this was the 1855–56 freeze. Here is a view of the ice still advancing to the Outer Harbor entrance—or receding, having already reached its furthest extent. Finding the direction and scope (or angle) of this view meant plotting two lines: one intersecting Ten Pound Island; the other, a small corner of George H. Rogers’s wharf. Placing the background in the middle of the harbor entrance—so there could be no land on the painting’s horizon—led to a viewing point on Fears’ Wharf off Duncan’s Point. Moving that point anywhere else would cause the resulting twelve-degree angle of view to narrow even more, or bring Norman’s Woe into the right background. Interestingly, Lane’s house is very close to this angle’s median line if it is extended inland, but the house is too high for this view. It must have been drawn no more than 10-12 feet above sea level, suggesting that Lane was drawing while sitting on the wharf at high tide. Another possibility is that Lane made his pencil sketch of this view in warm weather, then painted a winter version in the comfort of his studio. It is also possible that he used just a small section of a sketch with a much wider view. He had only to look out the window for colors, light, and cloud formations, then add vessels and human activity where he judged was most suitable. The result was a convincing winter scene, “painted from nature,” set in midafternoon with the midafternoon sun’s rays brightening wintry storm clouds off to the east. 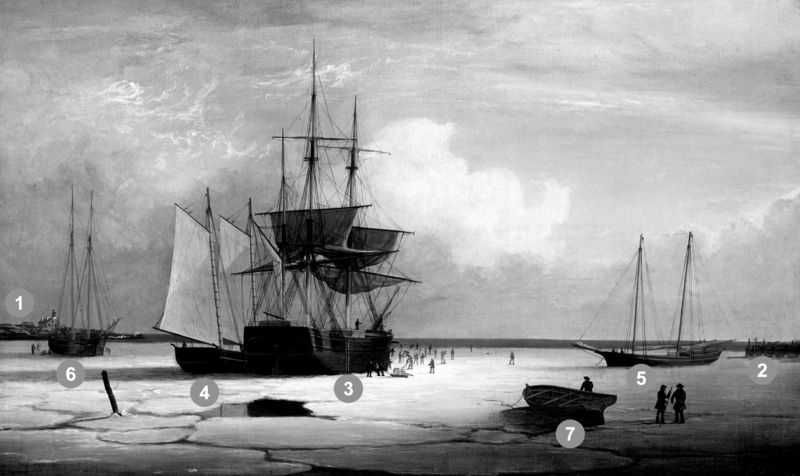 In left center is a merchant bark breaking through the ice to leave port. What appears to be boxes of provisions for the crew are being delivered by sled. Ahead of the bark is a team of men with picks and hammers, chopping and pounding the ice to form cracks and small pieces that the bark can dislodge and ride over. Astern in her shadow are loose blocks of ice that were pushed under and aside as the bark made headway. Secured to the bark’s side is a small schooner—probably used in the coasting trade—assisting in the ice-breaking process. With her sails set, she is forced by the wind to heel, bearing down on the ice and causing it to crack and break up, easing the bark’s task of breaking through. The two other schooners (far left and far right) are probably fishing vessels, their finely modeled hulls showing the growing presence and influence of the “sharpshooter” and “clipper” schooners. Improved rail transportation to the midwest was beginning to generate greater demand for fish—fresh fish in particular. This meant the need for faster vessels to get fresh fish quickly from the fishing grounds to market, sparking a revival in Gloucester’s fishing industry just as its foreign trade was in decline. The juxtaposition of a merchant bark of antiquated design among two trendsetting examples of fishing schooners in antebellum Gloucester is probably an unintended mix of promise and foreboding on Lane’s part, but there it is. Proposed viewpoint of Lane when creating the picture. Viewpoint plottings by Erik Ronnberg using U.S... [more]. Coast Survey sketch chart of Gloucester Harbor 1855. Chart shows limit of ice in the winter of 1855. Proposed viewpoint of Lane when creating the picture. Viewpoint plottings by Erik Ronnberg using U.S... [more]. Coast Survey sketch chart of Gloucester Harbor 1855. 1. The original painting, from which the lithograph was taken. 2. Winter scene, cutting vessels out of the ice. 3. View of a large boulder. These pictures will shortly be on exhibition at the store of Procter Brothers, where the lithographic view may now be seen. Few marine artists are equal to Mr. Lane in correctness and fulness of detail. His ships look like ships, and seem almost to be in motion, for they are drawn by one who knows every rope and line, both nautically and artistically. His reputation and established, and his pictures adorn the residences of many admirers in distant cities, where his productions are estimated according to there true value. We hope that his fellow citizens will appreciate the feeling which has prompted him to publish this new view of Gloucester, and by their patronage will reward him pecuniarily, as he deserves. The pictures offered as prizes are fine and faithful sketches of well-known localities, and need only to be seen to be appreciated. – Due notice will be given when they are ready for exhibition, and further particulars, in reference to the method proposed for disposing of them, will be announced." "Home Pictures- Our citizens should be thankful to our fellow townsman, F.H. Lane, Esq., who has reproduced the scene of winter of '56-7 on canvas, so life-like that one can almost imagine himself in the ice again. The picture is to join the new views of Gloucester as a prize." "DRAWING OF PAINTINGS.– The distribution of five oil paintings among the subscribers to Lane’s view of Gloucester, took place on Saturday Evening, at the store of Messrs. Procter Brothers. No. 125 took the first picture, being the original painting from which the view of Gloucester was engraved. It is a valuable picture, and Mr. John H. Whidden was the lucky holder of the number. The second picture, a winter scene, giving a representation of cutting vessels out of the ice, fell to No. 186, the holder of which was Mr. William Parsons, 2d. The third picture, a moonlight scene, was taken by No. 263, which was held by Mr. Joseph Richardson of Boston. The fourth, a landscape view, fell to No. 2, the owner of which was Mr. Solomon Pool. No. 93 took the fifth, a view of a large boulder, and Mr. William D. Winchester held the ticket." 2) Winter Scene, cutting vessels out of the ice. George H. Rogers was one of Gloucester's most enterprising citizens of the mid-nineteenth century. In the early 1830s, he ventured into the Surinam trade with great success, leading him to acquire a wharf at the foot of Sea Street. Due to Harbor Cove's shallow bottom at low tide, berthings at wharves had to be done at high tide, leaving the ships grounded at other times. Many deep-loaded vessels had to anchor outside Harbor cove and be partially off-loaded by "lighters" (shallow-draft vessels that could transfer cargo to the wharves) before final unloading at wharfside. To lessen this problem, Rogers had an unattached extension built out from his wharf into deeper water (see The Fort and Ten Pound Island, Gloucester (Harbor Scene), 1848 (inv. 58), right middle ground). The space between the old wharf and the extension may have been a way to evade harbor regulations limiting how far a pier head could extend into the harbor. Stricter rules were not long in coming after this happened! About 1848, Rogers acquired land on the east end of Fort Point, first putting up a large three-story building adjacent to Fort Defiance, then a very large wharf jutting out into Harbor Cove. Lane's depictions of Harbor Cove and Fort Point show progress of this construction in 1848 (The Fort and Ten Pound Island, Gloucester (Harbor Scene), 1848 (inv. 58)), 1850 (Gloucester Inner Harbor, 1850 (inv. 240)), and c.1851 (Gloucester Harbor, c.1852 (inv. 563)). A corner of the new wharf under construction can also be seen more closely in Ten Pound Island, Gloucester, 1850s (inv. 17) and Ten Pound Island in Gloucester Harbor, 1864 (inv. 104) (foregrounds). This new wharf provided better frontage for large ships to load and unload, as well as larger warehouses and lofts for storage of goods and vessel gear. Lowe's Wharf, adjacent to Fort Wharf, was acquired by (Sylvester) Cunningham & (William) Thompson, c.1877 and used in "the fisheries" as well. That wharf and its buildings were enlarged considerably as the business grew. By this time, Harbor Cove was completely occupied by businesses in the fisheries or providing services and equipment to the fishing fleet. In photographs of Fort Point from this period, it is difficult to distinguish one business from another, so closely are they adjoined. 1. A city atlas, dated 1899, indicates that Rogers's wharf at Fort Point was still listed as part of his estate. If so, then Stanwood & Co. would have been leasing that facility from the Rogers's estate. "Map of the Towns of Gloucester and Rockport, Massachusetts. H.F. Walling, Civil Engineer. John Hanson, Publisher. 1851. Population of Gloucester in 1850 7,805. Population of Rockport in 1850 3,213." Segment of Harbor Village portion of map showing Low's, Rogers', and other wharves in the Inner Harbor. Ignatius Weber's windmill (now defunct) is shown. Through the years, this point and its fortifications had many names: Watch House Point, the Old Battery, Fort Defiance, Fort Head, and now just "The Fort." In 1793, Fort Defiance was turned over to the young United States government and was allowed to deteriorate. During the War of 1812 it was described as being "in ruins," and any remaining buildings burned in 1833. It was resuscitated in the Civil War and two batteries of guns were installed. The City of Gloucester did not regain ownership of the land until 1925. The first fortifications on this point, guarding the entrance to the Inner Harbor, were put up in the 1740s, when fear of attack from the French led to the construction of a battery armed with twelve-pounder guns. Greater breastworks were thrown up in 1775, after Capt. Lindsay and his sloop-of-war the "Falcon" attacked the unprepared town. They were small and housed only a few cannon and local soldiers. Several other fortifications were at various times erected around the harbor: Fort Conant at what is now Stage Fort Park, another on Duncan's Point (near site of Lane's house) and the Civil War fort on Eastern Point. None of these preparations was ever called upon to actually defend the town. Lane during his lifetime created a long series of images of the point and the condition of its fortifications. In 1832 there were still buildings standing, and the point had not yet been used for major wharves and warehouses. By the time of his painting Gloucester Harbor, 1852 (inv. 38), one can see that the earthwork foundation, but no superstructures, survived. George Steele sail loft, William Jones spar yard, visible across harbor. Photograph is taken from high point on the Fort, overlooking business buildings on the Harbor Cove side. About picture of Old Fort hanging in the Gloucester Bank: "This picture is chiefly of interest on account of its preserving so accurately the features of a view so familiar to many of our citizens and which can never exist in reality." "Drawn on a scale of one hundred feet to an inch. By John Mason 1834–45 from Actual Survey showing every Lott and building then standing on them giving the actual size of the buildings and width of the streets from the Canal to the head of the Harbour & part of Eastern point as farr as Smith's Cove and the Shore of the same with all the wharfs then in use. Gloucester Harbor 1834–35." This map is especially useful in showing the Fort. "Fort Hill was occupied by Capt. H. C. Mackay and John Lowe, as a flake-yard, and there were but one or two old fish-houses in the vicinity. The improvements at this point during the last fifteen years have left no traces of its former appearance, almost every landmark having been obliterated. A very good idea of the place as it then appeared may be obtained from the painting of Fitz H. Lane, Esq., now on exhibition at the Reading Room under the Gloucester Bank." "By the will of the late Fitz H. Lane, Esq., his handsome painting of the Old Fort, Ten Pound Island, etc., now on exhibition at the rooms of the Gloucester Maritime Insurance Co., was given to the town... It will occupy its present position until the town has a suitable place to receive it." To the Selectmen of Gloucester: / Gents: The will of our late Townsman, Fitz. H. Lane, contains this provision: / I give to the inhabitants of the Town of Gloucester, the picture of the Old Fort, to be kept as a memento[sic] of one of the localities of olden time; the said picture now hanging in the Reading Room under the Gloucester Bank, and to be there kept until the Town of Gloucester shall furnish a suitable and safe place to hang it. / The original sketch was taken twenty-five years ago, but the boats and vessels introduced are those of a quarter of a century earlier still. The painting was executed in 1859, six years before his decease." View from top of Unitarian Church on Middle Street looking southeast, showing the Fort and Ten Pound Island. Tappan Block and Main Street buildings between Center and Hancock in foreground. Ten Pound Island guards the entrance to Gloucester’s Inner Harbor and provides a crucial block to heavy seas running southerly down the Outer Harbor from the open ocean beyond. The rocky island and its welcoming lighthouse is seen, passed, and possibly blessed by every mariner entering the safety of Gloucester’s Inner Harbor after outrunning a storm at sea. Ten Pound Island is situated such that the Inner Harbor is protected from open water on all sides making it one of the safest harbors in all New England. Legend has it that the island was named for the ten pound sum paid to the Indians for the island, and the smaller Five Pound Island deeper in the Inner Harbor was purchased for that lesser sum. None of it makes much financial sense when the entirety of Cape Ann was purchased for only seven pounds from the Indian Samuel English, grandson of Masshanomett the Sagamore of Agawam in 1700. From approximately 1640 on the island was used to hold rams, and anyone putting female sheep on the island was fined. Gloucester historian Joseph Garland has posited that the name actually came from the number of sheep pens it held, or pounds as they were called, and the smaller Five Pound Island was similarly named. The island itself is only a few acres of rock and struggling vegetation but is central to the marine life of the harbor as it defines the eastern edge of the deep channel used to turn the corner and enter the Inner Harbor. The first lighthouse was lit there in 1821, and a house was built for the keeper adjacent to the lighthouse. In the summer of 1880 Winslow Homer boarded with the lighthouse keeper and painted some of his most masterful and evocative watercolor views of the busy harbor life swirling about the island at all times of day. Boys rowing dories, schooners tacking in and out in all weather, pleasure craft drifting in becalmed water, seen together they tell a Gloucester story of light, water and sail much as Lane’s work did only several decades earlier. From The Illustrated Coast Pilot with Sailing Directions. The Coast of New England from New York to Eastport, Maine including Bays and Harbors, N. L. Stebbins, 1891. 9 1/2 x 8 in. Barks had significant presence in mid-nineteenth-century America, as indicated by Lane’s depictions of them. Hardly any are to be found in his scenes of major ports, but some do appear in his Cape Ann scenes (see The Fort and Ten Pound Island, Gloucester (Harbor Scene), 1848 (inv. 58), View of Gloucester, 1859 (inv. 91), Gloucester Harbor, 1850s (inv. 391), and Bark "Eastern Star" of Boston, 1853 (not published)), also in views of other small ports and of coastal shipping (see Clipper Ship "Southern Cross" in Boston Harbor, 1851 (inv. 253), Merchantmen Off Boston Harbor, 1853 (inv. 267), Approaching Storm, Owl's Head, 1860 (not published), and Bark "Mary" (inv. 629)). The term barkentine, like the bark, pre-dates the nineteenth century, but in the mid- to late 1800s referred to a large vessel of three masts (or more), with only the fore mast square-rigged, the others being fore-and-aft-rigged. In Lane’s time, the term was little known in the United States, while many other names were coined for the rig. One of these early terms was demi-bark, probably from the French demi-barque, which was applied to a very different kind of vessel. (5) Lane’s depictions of these rigs include a lithograph of the steam demi-bark "Antelope" View of Newburyport, (From Salisbury), 1845 (inv. 499) and at least three depictions of Cunard steamships The "Britannia" Entering Boston Harbor, 1848 (inv. 49), Cunard Steamship Entering Boston Harbor (inv. 197), and Cunard Liner "Britannia", 1842 (inv. 259). (6) None of these subjects typify the barkentine rig as applied to sails-only rigs as they developed in the years after Lane’s death. 1. R[ichard] H[enry] Dana, Jr., The Seaman's Friend (Boston; Thomas Groom & Co., 1841. 13th ed., 1873), 97 and Plate IV with captions; and M.H. Parry, et al., Aak to Zumbra: A Dictionary of the World's Watercraft (Newport News, VA: The Mariners’ Museum, 2000), 43. 2. Alfred Mansfield Brooks, Gloucester Recollected (Gloucester, MA: Peter Smith, 1974), 56, note 10; 67, note 7. 3. James R. Pringle, History of the Town and City of Gloucester (1892. Reprint: Gloucester, MA, 1997), 106–08. 4. Raymond McFarland, A History of the New England Fisheries (Philadelphia: University of Pennsylvania, 1911), 95–96; and Mark Kurlansky, Salt: A World History (New York: Walker & Co., 2002), 419–420. 5. Parry, 44, 167. Dana has neither definition nor illustration of this rig. 6. J[ohn] W. Griffiths, “The Japan and China Propeller Antelope," U.S. Nautical Magazine III (October 1855): 11–17. This article includes an impression of Lane’s lithograph on folded tissue. This view of Gloucester's Inner Harbor shows three square-rigged vessels in the salt trade at anchor. The one at left is a (full-rigged) ship; the other two are barks. By the nature of their cargos, they were known as "salt ships" and "salt barks" respectively. Due to their draft (too deep to unload at wharfside) they were partially unloaded at anchor by "lighters" before being brought to the wharves for final unloading. A bark is square-rigged at her fore and main masts, and differs from a ship in having no top, and carrying only fore-and-aft sails at her mizzenmast. 4. Howard I. Chapelle, The National Watercraft Collection (Washington, DC: Smithsonian Institution, 1960), 74–76. 5. Howard I. Chapelle, The American Fishing Schooners (New York: W.W. Norton & Co., 1973), 58–75, 76–101. 28 x 48 1/2 in. Cape Ann Scenery: No. 321 " Marine Study"
stereo image, "x " on card, "x"
View showing a sharpshooter fishing schooner, circa 1850. Note the stern davits for a yawl boat, which is being towed astern in this view. Model of fishing schooner "Amy Knight"
Thomas M. Hoyne Collection, Mystic Seaport, Conn. While this model was built to represent a typical Marblehead fishing schooner of the early nineteenth century, it has the basic characteristics of other banks fishing schooners of that region and period: a sharper bow below the waterline and a generally more sea-kindly hull form, a high quarter deck, and a yawl-boat on stern davits. The simple schooner rig could be fitted with a fore topmast and square topsail for making winter trading voyages to the West Indies. The yawl boat was often put ashore and a "moses boat" shipped on the stern davits for bringing barrels of rum and molasses from a beach to the schooner. Jeffrey Bolster, Black Jacks: African American Seafarers in the Age of Sail (Cambridge, MA: Harvard University Press, 1997). Howard I. Chapelle, American Small Sailing Craft (New York: W.W. Norton & Co., 1951), 29–31. Cape Ann Museum Library & Archive, Gloucester, Mass. The image, as originally drafted, showed only spars and sail outlines with dimensions, and an approximate deck line. The hull is a complete overdrawing, in fine pencil lines with varied shading, all agreeing closely with Lane's drawing style and depiction of water. Fishing schooners very similar to this one can be seen in his painting /entry:240/. "Shipping Intelligence: Port of Gloucester"
"Fishermen . . . The T. [Tasso] was considerably injured by coming in contact with brig Deposite, at Salem . . ."
"A Prize Race—We have heard it intimated that some of our fishermen intend trying the merits of their "crack" schooners this fall, after the fishing season is done. Why not! . . .Such a fleet under full press of sail, would be worth going many a mile to witness; then for the witchery of Lane's matchless pencil to fix the scene upon canvass. . ."
Article about new masthead, designed by Lane. "Gloucester Harbor from Rocky Neck, Looking Southwest. This gives a portion of the Harbor lying between Ten Pound Island and Eastern Point. At the time of taking this picture the wind was from the northeast, and a large fleet of fishing and other vessels were in the harbor. In the range of the picture about one hundred vessels were at anchor. In the small Cove in the foreground quite a number of dories are moored. Eastern Point appears on the left in the background." Southeast Harbor was known for being a safe harbor. Cape Ann Scenery: No. 82 View of Sch. "E. A. Horton"
"Said schooner was captured about the first of September, 1871, by Capt. Torry, of the Dominion Cutter 'Sweepstakes,' for alleged violation of the Fishery Treaty. She was gallantly recaptured from the harbor of Guysboro, N.S., by Capt. Harvey Knowlton., Jr., (one of her owners,) assisted by six brave seamen, on Sunday night, Oct. 8th. The Dominion Government never asked for her return, and the United States Government very readily granted her a new set of papers." Schooner fleet anchored in the inner harbor. Looking east from Rocky Neck, Duncan's Point wharves and Lane house (at far left), Sawyer School cupola on Friend Street. As Erik Ronnberg has noted, Lane's engraving follows closely the French publication, Jal's "Glossaire Nautique" of 1848. ~40 in. x 30 in. Model shows mast of fishing vessel being unstepped. 8 3/4 x 19 3/4 in. Fishing schooners in Gloucester's outer harbor, probably riding out bad weather. Print from bound volume of Gloucester scenes sent to the Philadelphia Centennial Exhibition. Schooner "Grace L. Fears" at David A. Story Yard in Vincent's Cove. The Ten Pound Island light was built on a three-and-a-half acre island at the eastern end of Gloucester Harbor. Built as a conical stone tower, the original 20-foot-tall Ten Pound Island Light was first lit in October, 1821 after the Commonwealth of Massachusetts and the Town of Gloucester ceded 1.7 acres to the U.S. Government for the construction of an inner harbor lighthouse to help mariners navigate the harbor. Ten Pound Island light was a popular subject with artists, including Winslow Homer, who boarded with the lighthouse keeper at Ten Pound Island in the summer of 1880. It is frequently featured in Lane's paintings of Gloucester Harbor. This information has been shared with the Lane project by Jeremy D'Entremont. More information can be found at his website, www.newenglandlighthouses.net or in The Lighthouse Handbook New England. This information has also been summarized from Paul St. Germain's book, Lighthouses and Lifesaving Stations on Cape Ann. History of Ten Pound Island Light, Gloucester, Mass. The photo shows the first lighthouse constructed in 1821. Mrs. John LeFavour Stanley, Gloucester, Mass. 1859 Procter Brothers: Procter Brothers, Gloucester, Massachusetts. 1944 Colby College: Colby College, Waterville, Maine, Exhibition of Marine Painting. 1954b M. Knoedler & Co.: M. Knoedler & Co., New York, New York, Commemorative Exhibition of Karolik Private Collection Paintings by Martin J. Heade and Fitz Hugh Lane, no. 7. 1960–62 American Federation of Arts: American Federation of Arts, New York, New York, The Hudson River School. 1965–66 Everson Museum: The Everson Museum of Art, Syracuse, New York, American Painting from 1830. 1966 DeCordova Museum: DeCordova Museum, Lincoln, Massachusetts, Fitz Hugh Lane: The First Major Exhibition, no. 22. 1967 Montreal Museum of Fine Arts: Montreal Museum of Fine Arts, Montreal, Quebec, The Painter and the New World. 1969 Miami Art Center: Miami Art Center, Miami, Florida, The Artist and the Sea. 1974 Farnsworth Art Museum: John Wilmerding, Rockland, Maine, Fitz Hugh Lane 1804-1805, no. 41. 1974–75 Northern Illinois University: Northern Illinois University, Dekalb, Illinois, Near Looking. 1975 Whitney Museum: Whitney Museum, New York, New York, Seascape and the American Imagination. 1976 MacNider Museum: Charles H. MacNider Museum, Mason City, Iowa, 10th Anniversary Exhibition. 1976 Museum of Fine Arts, St. Petersburg: Museum of Fine Arts, St. Petersburg, Florida, Marine Painting. 1980–81 Museum of Fine Arts: Museum of Fine Arts, Boston and American Federation of Arts, Des Moines, Iowa, The Boston Tradition. 1988 National Gallery of Art: National Gallery of Art, Washington, District of Columbia, Paintings by Fitz Hugh Lane, no. 3, ill., p. 22. Museum of Fine Arts, Boston 1949: M. and M. Karolik Collection of American Paintings, 1815 to 1865. Museum of Fine Arts, Boston 1957: American Paintings 1815–1865: One Hundred and Fifty Paintings from the M. and M. Karolik Collection in the Museum of Fine Arts, Boston. Wilmerding 1964: Fitz Hugh Lane, 1804–1865: American Marine Painter. Montreal MFA 1967: The Painter and the New World. Wilmerding 1968: A History of American Marine Painting. Museum of Fine Arts, Boston 1969: American Paintings in the Museum of Fine Arts, Boston. Mendelowitz 1970: A History of American Art. Wilmerding 1971a: Fitz Hugh Lane. Wilmerding 1971c: "Fitz Hugh Lane: Imitations and Attributions." Farnsworth 1974: Fitz Hugh Lane 1804-1865, no. 41. Stein 1975: Seascape and the American Imagination. Coe Kerr Gallery 1978: American Luminism. Troyen 1980: The Boston Tradition: American Paintings from the Museum of Fine Arts, Boston. Baigell 1984: A Concise History of American Painting and Sculpture. Wilmerding 1987: American Marine Painting. Wilmerding 1988a: Paintings by Fitz Hugh Lane, p. 22. Wilmerding 2005: Fitz Henry Lane, ill. 60, text, p. 63. Novak 2007: American Painting of the Nineteenth Century: Realism, Idealism, and the American Experience, with a New Preface. Citation: "Ships in Ice off Ten Pound Island, Gloucester, 1850s (inv. 44)." Fitz Henry Lane Online. Cape Ann Museum. http://fitzhenrylaneonline.org/catalog/entry.php?id=44 (accessed April 18, 2019). Record last updated March 7, 2017. Please note that the information on this and all pages is periodically reviewed and subject to change.